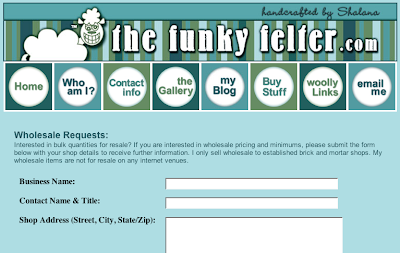 The Funky Felter: Website update at thefunkyfelter.com - new feltmaking resources added and wholesale request submission form! Website update at thefunkyfelter.com - new feltmaking resources added and wholesale request submission form! I spent most of yesterday updating my main fiber art website, thefunkyfelter.com. There were just a lot of little things that needed to be adjusted and made current with the latest information and links. Since I built my own website, I also have the chore of maintaining it which is not my favorite thing to do, but an absolute necessity. I'd much rather be felting! 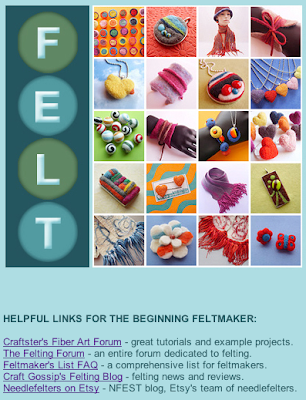 I further developed my "About Felting" page by adding a few helpful resources for the beginning feltmaker. I added links to some of my favorite sites and forums that focus on felting. If any of my fellow feltmakers out there have another resource site to suggest (not your own blog please unless it is solely a felting resource), then leave its link in a comment. I'd like to be able to develop the list a bit more. I've also thought about adding a list of feltmaker's supply sources, but there are just so many out there that I haven't been able to narrow it down enough yet to fit on my web page. That may eventually call for adding another page to my website, but if you'd like to suggest your favorite felting supply source in a comment, I would appreciate it. Although, I don't know when I will add it to my website as I need to figure out the logistics of it all and the layout. Along with minor updates and adding a resource list, I also revamped my wholesale request page. It is only recently that I've committed to offering my handmade felted items at wholesale rates to brick and mortar shops. I don't offer my full line yet, but rather some of my smaller items only. I decided to do this after getting many requests for wholesale and consignment. Unfortunately after a bad experience with out-of-state consignment, I now only consign to reputable local shops - ones that I can visit and check on my items. Anyway, I updated my wholesale request page to include a submission form so that interested shops, boutiques, etc., can submit their information to me easily. As I've said before, I am not a web design guru so I rely on a form service from response-o-matic.com to help with this. I know that if you're a savvy website designer, you're probably thinking "but forms are easy" - well, hopefully, I can figure them out one day and revamp my wholesale page again, but until then, this works. (If you have any form knowledge to bestow on me, please feel free to leave it in a comment.) I hope the addition of a submission form will make it easier for interested businesses to contact me. I also think that it is more professional than just an email link, but I like emails too of course!